This tutorials a quickie, I'm going to do what tutorial writers seem to do all the time and make the artwork crap, I don't really want to focus on making a scene pretty and everything for everyone to look at, I'll get right to the point. In this tutorial I want to just focus on "if you have a deadline that's in a few hours time (let say it's 3am, and the flame* session is at 8am, and you need to pump out a shot or two in that amount of time) how to be rough and get the work done but make it still look good. I've just had one of those weeks myself which is what kind of gave me this idea, I'm about to go home and sleep for the first time in a few days, and figured I'd write this one out quickly, so lets get to it. The car is speeding along the road and large boulders are raining down left right and center, your job is just to create the particle debris and particle dust when the rocks hit the ground, and for the last giant boulder, make it shatter right in front of the camera. First of all load up the max file, The idea behind this exercise is that you have a huge deadline and don't have time to just set up everything you'll need to pump them out quickly. In a way we're going to make a 'particle kit' basically a basic set up of a particle system you can clone lots of times and place allover the place with minimum trouble. So first of all go to the first frame a rock hits the ground and go to the create panel and click on the line tool icon and create a spline around the shape, try to mimic what it looks like roughly. We're doing this just so in future if the objects were irregular you wouldn't have to make a square around them still. Okay once you've created the line go to the modify panel and hit the tessellate button or else go to and select it from in there. 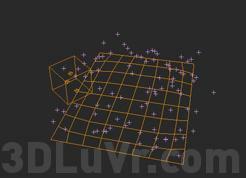 This will add more detail to the spline as well as making it a polygonal mesh oposed to a spline. This way we can use it to emit particles from it. So now adjust the settings so that it's a bit more even by hitting the polygons icon (the square) in the tessellate options and adjust the tension to 0 so it makes it a square grid (basically the more geometry the more areas we can emit particles from. Now hit 3 on the iterations scale so we can have more squares to emit from. 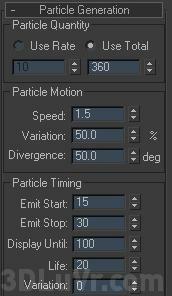 Now go to the create panel again and go down to particle systems and drag out a parray particle system. Position it over where the grid shape is so we know it's for that rock's dust. And go to the modify panel and click on pick object. 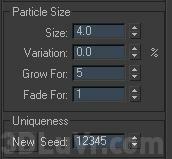 Select the grid as the emitter type this way it will emit the particles from the grid when we tell it to.